The BRT3 tail light has 3 super-bright LEDs and a built in parabolic reflector to make you visible to motorists up to 2000 feet away. Power switch changes between flash and steady mode, providing up to 200 hours of run time on three AAA batteries. The compact case mounts easily to a seat post or frame and is lightweight, weatherproof and durable. Sure, its a cheap light. But it works really well! It's bright, inexpensive and batteries last a long time in flash mode. This is the perfect light for a commuter bike. Good basic taillight. I use it for day time riding and it is definitely bright enough. Comes with both seat post and seat stay mountings which you dont always find. Only drawback is that it uses two batteries instead of USB charging. Still gives pleanty of run time. A good value. Good basic taillight. I use it for day time riding and it is definitely bright enough. Comes with both seat post chain and stay mountings which you dont always find. Only drawback is that it uses two batteries instead of USB charging. Still gives pleanty of run time. A good value. I have a few bikes, but one bike in particular which I love dearly for its breathtaking simplicity and joy to ride is my single-speed District S. Those of you who love all the bells and whistles may find it hard to appreciate the struggle I had in coming to the point of putting a light on such a bike, a bike meant to be kept stripped to its essence, but I decided that enjoying my rides even after work in the black of winter after work was a better choice than being run down by a car. SO this is the light I decided upon, and Ive been extremely happy with this choice. The price is misleading, the light is practically free compared to what you could spend for a tail light, and there are choices with 5 or more LEDs, but this 3-LED light is surprisingly bright and, a point which I like, straightforward to operate - on 'steady', on blinking', and off, and by pushing one button which I can push even with full mittens on. On top of all that, the light runs forever - well, for 200 hours, quite a few rides - on one set of AAA batteries, and the light has a very simple, pleasing design and shape which even looks right at place on my single-speed. Light and efficient, but not bright enough to save your life as a commuter. Returned for the Blinky Super Flash. When you need to be seen, the Planet Blinky rules the night! Snap it on and off depending on the time of day for training. The mount stays on my bike for races and the light comes off. It is so easy to use and it is one of the best safety devices you can buy, a great value! Simple is easy to use tail light. I put one on my daughters bike and 2 on a bike trailer that I bought. They both work well. They are light weight and can be seen for a long distance. Very easy to mount. A must for cycling in cloudy rainy weather or in the evening. 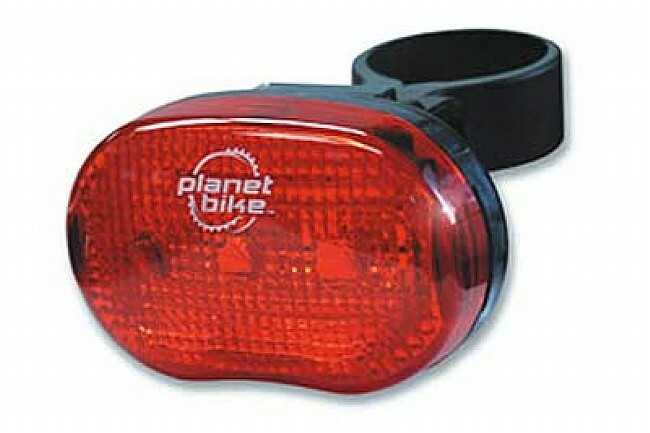 A must for traveling by bike in darker conditions as evening, cloudy rainy days. Can be seen a ways off and alerts to motorist a bicycle is ahead of them. I believe it has saved me from numerous collisions from the motorist that does not agree with sharing the road. Its use of AAA batteries makes it convenient to have plenty of spares and they are easy to find. If it only had a remote to turn the lights off or on while on the go. Not the best, but works. A little difficult to figure out how to get the lense off to put batteries in. Doesn't come with instructions, so be careful not to break it getting it open. Good for my occational night ride. But I would be willing to pay 20dollars more for a better one, if I biked at night all the time.